Politicians in the Eurozone are relieved these days as they see commodities and especially crude oil prices retracting to levels last seen a year earlier. But the improving outlook on the price front comes at the heavy price of monetary inflation. The hope for a slowdown in price inflation is overshadowed by the terrifying numbers on the ECB's balance sheet that almost touched the €2 TRILLION level with a balance sum of 1,973 billion as of October 17. This is 57% more money YOY while the European economy started slipping into a recession. Lending to banks immediately took off to never before seen levels since the ECB changed its rules and now takes more or less any crap paper as collateral. Monetary inflation is now clearly written on the wall as the expansion of the ECBs weekly financial statement has become ballistic. Within only one week the ECB's lending increased 4.8% overall, according to latest figures. The unlimited swaplines of the Fed begin to show up here without a doubt. In a YOY comparison Eurozone bank lending more than doubled from €471 billion to currently €1.057 trillion. This comes hand in hand with a continuous flow of downgraded expectations for the Eurozone economy that may record a contraction in the last quarter of 2008. The ECB's loose hand may have prevented a systemic disruption so far, but if the speed of money creation does not get reduced Europe could find itself saddled with runaway monetary inflation as there is an explosive lot of money sloshing around a steady pool of products and services. Europe is facing its worst financial crisis in decades. Credit growth is slowing and domestic demand is weakening across the continent. At the same time, past commodity price increases have boosted headline inflation, depressing consumption. In advanced Europe, a mild recession is expected in the near term. Real GDP growth is projected to drop to 1.3 percent in 2008 and 0.2 percent in 2009 (down from 2.8 percent in 2007). Growth is weakening in the emerging economies as well. 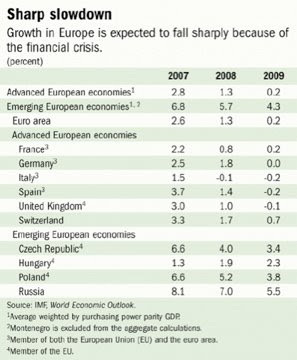 The IMF predicts a mild recession for Italy, Spain and the UK in 2009. In order to avoid a sharper downturn the IMF pledges for coordinated action of European governments. This call went so far unheard. European politicians may be setting up common meetings, but so far each country has taken its own way in order to end the credit crisis.